Hi. 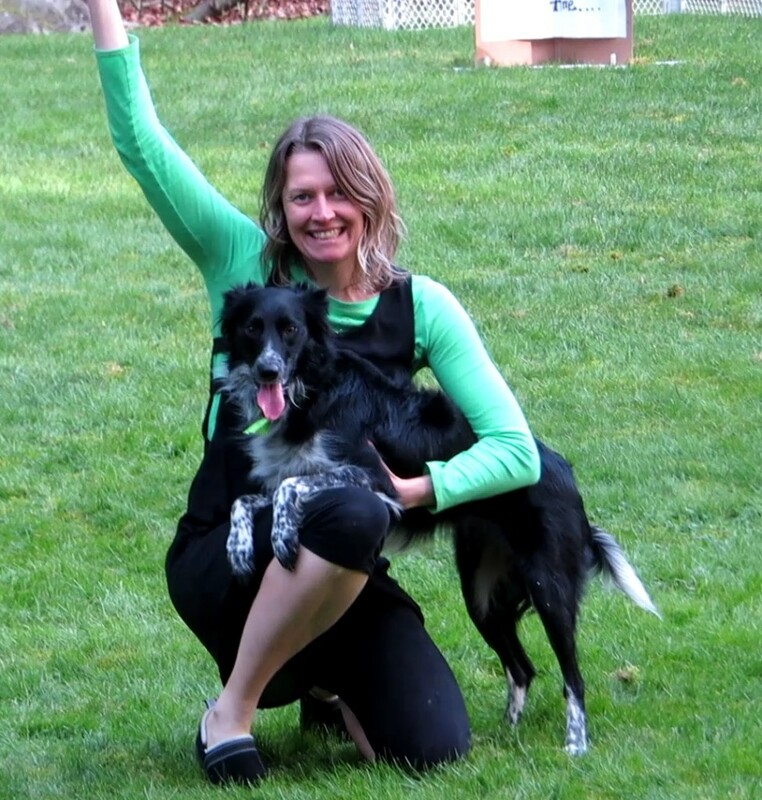 I’m Cloudine, owner, certified trainer, and instructor at In Joy Dog Training and I’m grateful for this chance to tell you a little bit about myself. With over 2 decades of professional experience, my background story is a little long and what follows is a tiny book. My intention is to give you an idea of who I am because you won’t usually find me active on Facebook or at competition events. To me, the whole point of training is to be able to do more with your dog. I want to be able to take my dogs anywhere to train, and include my dogs in my life as much as possible. Rather than sign them up for regular competitions (that they don’t tend to care for as much as hiking), I honor who a dog is by nature and we do things that work for both of us. I train A LOT! And, when I do make an appearance at an event, you’ll see dogs that are very well-prepared for the challenges. I pride myself on being able to build value for the behaviors in and of themselves. You can then utilize tricks to reinforce other behaviors you like (like walking with you) with activities/tricks that your dog loves to do (without needing to feed your dog constantly). There’s a science behind all that that I love to share with people! If you’ll indulge me, let me take you through my history a bit. My introduction to animal training started with horses when I was just 9 on a lunge line. I learned how to “sit” before ever being handed the reins to a horse’s mouth, and thus began my appreciation of how critical good foundation training is. Due to tremendous opportunity, I was riding 2-5 horses a day, 4-6 days a week, eventually working as an instructor and training and exercising peoples’ horses for them, with the goal of becoming an Olympic level horseback rider. You might be thinking, ‘wow, that’s young to be instructing!’ and that’s the same thing some of my students thought. I remember one woman expressing how it was hard to struggle with something when this little girl could do it so easily. Starting off right with a good foundation and being a malleable youngster makes such a difference… and it is no different for a puppy. A young dog brought up in wise and practiced hands can demonstrate skills the likes of which you’ve never imagined. Things work out so much better when you train well from the start, as those who have struggled with retraining know all too well! My abilities and luck offered me some exceptional opportunities beyond just shoveling it, grooming and cleaning tack; such as traveling to Germany as a working riding student for two top level riders (Herr Plaege and Colonel Herr von Ziegner)….where I certainly got a chance to shovel some more. It gave me quite a work ethic, especially for a kid! 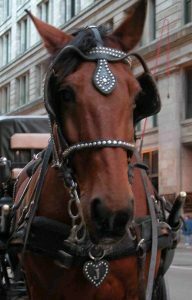 After 8 years of riding horses, I switched to driving horse-drawn carriages…in downtown Chicago. I have to tell you, there is nothing like rolling up to someone who’s having a bad day and lost in thought, and surprising them with a funny remark and the obscurity of a horse carriage in the city! Imagine working with a flighty animal in impossible conditions while entertaining passengers. The bane of those days was getting stopped at a red light on Michigan Ave when the traffic helicopter would fly over on a windy day. On such days, the wind would build speed as it raced down the mile high face of the John Hancock, cross the street, and snap the Bloomingdale flags like a whip. Never a dull moment, I assure you. After over a decade of working with these incredible animals, the horse and I parted ways. Meanwhile, I almost always had dogs with me. I tried to train “agility” before I knew it existed, asking my Scottish Deerhound to jump lawn chairs turned sideways and tromping all over the place with him, a Cheasy mix, and a Jack. We had tons of crazy adventures. Unfortunately, the dog training I was exposed to back then didn’t utilize any fun or the systems that science has proven to be most effective. So, while I did train those dogs, it was based off of my horsemanship skills and a lot of bad information. So, not surprisingly, none of us embraced “training”. When I was in my early 20s, I was blessed with a puppy I named Tallah. She was a wonderful little Dingo lookalike who was exceptionally “well-behaved” being raised in my hands. However, talking to a carriage-driver turned dog trainer, we decided that my loose structure with Tallah was actually doing her a disservice. To give you an idea of what our life was like, I would have conversations with her rather than give clear cues. We decided that some sort of structure would help Tallah feel more confident. So, I looked around at my options and thought agility looked fun. I started off on the wrong foot with agility…and it was still fun. But, it was not ideal when I wanted her to do things that she hadn’t built value for. She “did all the equipment” within 7 weeks quite courageously and cooperatively, with a perfect recall and manners around the others, but she did not light up and beam with joy at the sight of and opportunity to play agility (which ought to be anyone’s priority). My dog and I needed help in ways that may have been beyond the capacity of those instructors in that setting. There’s way more to it than simply getting your dog around a course…which she was doing. But, I wanted more, I just didn’t know how to help her yet. I tried to figure out how to truly motivate her. I started taking classes at multiple places and doing everything I could to educate myself, including working with over 30 dogs at once at a daycare to observe behavior and how dogs play. I met Diana Hoyem and began assisting her with classes. Her emphasis on relationship rather than pressuring a dog was a pronounced difference to the standard. This spoke to a crucial missing piece in my understanding of training sports. I’m grateful to Diana for helping me salvage Tallah’s interest in agility and for giving me the chance to work with her and her students. Around 2007 I started In Joy Dog Training. After a few years of teaching agility, I thought it prudent to break out foundation skills (like how to use positive reinforcement successfully, get your dog to come when called, work around distractions, etc) to make classes accessible to the general public. In addition to my own school, I taught Puppy Perfectors’ agility program for a while to see if I could lighten up on the details and let people run agility courses and “just have fun”. But, problem behavior crops up left and right and can’t adequately be addressed on the fly. It is exhausting and unproductive to attempt to focus on agility (or any other advanced training) without a foundation in place. So, back to working solo with my own program…which is always evolving. Agility is an intense sport, and with it comes a high percentage of shoulder and hip injuries from the strain of lots of jumping, turns while landing, last minute changes of direction due to imperfect signals, and taking off to sprint at the drop of a hat (often without sufficient time to warm up). That, plus the fact that a dog that excels at agility is often an “enthusiastic” dog who, left to his own devices, is already prone to injury. So that led me to my current priority: K9 P.E. (my version of dog fitness). While I’ve had fitness plans for my animals throughout the years, it wasn’t until the last few years that I seriously started researching the topic. My dog Irie is my second dog with a mystery injury that only presented for the slightest moment before disappearing entirely. The problem with some dogs is that their excitement for life causes adrenaline to mask any signs of a problem (more about that here). Every so often I’d notice an injury and rest Irie from strenuous training. I took both of my dogs to a number of vets to no avail. At some point, I decided that if a vet can’t pinpoint the problem, maybe I could discover the source of her problem through conditioning exercises. 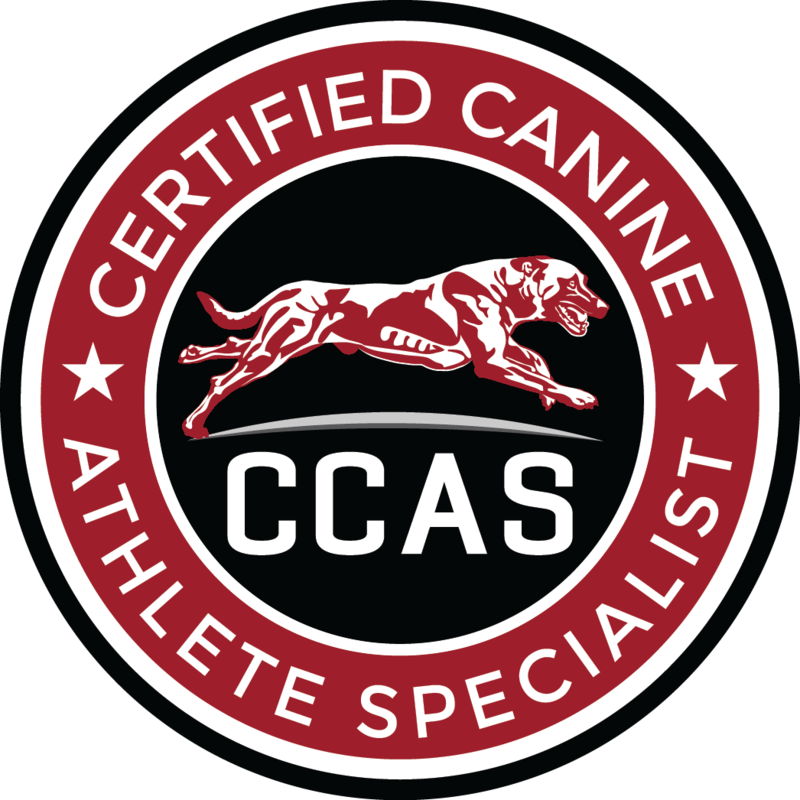 This led me to officially study conditioning with Northeast K9 Conditioning, along with a number of other courses, working with a few different rehab vets, and studying everything I can get my hands on. Because of my dogs’ injuries, a couple new sports (Rally-FrEe and then Freestyle) took center stage in my own dogs’ training. Years ago I also spent some years working on Rally-O and Obedience, even competed a couple times, but those sports didn’t do it for me. However, Rally-FrEe spoke to me because it requires even more precision and has way more tricks to train AND it is trained on every side of your body (it was always weird to me that in Obedience you heel only on the left). IMO, to be able to train many more tricks in many more positions demands a trainer to be more organized than with agility or obedience. I was excited by this challenge and worked my way up to the top level and earned a Grand Championship in Rally-FrEe in 2017. Not only is RF a sport that emphasizes precision and a high caliber of training, the creator of the sport embraces creativity and the love and is a wonderful person to work with. So, I wanted to support the sport and became a judge for RFE. The support the judges receive and the community around it is truly positive in so many ways. I appreciate the opportunity to be part of it and have learned a lot together with them. I understand the value of knowing what it takes to compete a dog and continue to challenge myself. However, my preference is to go out and perform a demo of my freestyle routine. The environmental challenges are there, the long chains of behaviors ask so much of the dog, yet, I have the opportunity to reward my dog if and when I chose to…at any time. I’m very into free-form, so, as time goes on, I realize Freestyle suits me very well. Know that you can only go “beyond form” when you have skills. Hand in hand with that, my teaching style is somewhat organic. This is partly due to the fact that, regardless of what you or I have planned, the dog will tell us what we need to work on. Dogs are individuals and there isn’t a simple formula that I can ethically hand you. My system asks you to be involved with your dog. It’s a functional system that requires an amount of presence and common sense for you to apply it. I welcome questions and conversations and want to find solutions that work for you. You ultimately are your dog’s trainer. To honor both you and your dog, we must look at what your wishes are, what your life is like, and how we can work with what the dog is capable of achieving. I LOVE to design agility courses that continually advance teams’ skills. My students and I have grown so much over years of running courses together. My courses are very well received and my only regret about not competing regularly is that I can’t become an agility judge. As a judge, more people could have fun on my courses. Over the years, I’ve had at most 3 dogs at once. While training is my life, I want to have a balanced life and make sure to take excellent care of those entrusted to my care. I’m more of a 2 dog kinda person (and consider my toddler to be 1 of the puppies). In addition to my own dogs, I like to work with other peoples’ dogs. For years I had an exclusive hiking service where I’d bring 2 or 3 client dogs along with my 2 every day. My preference is to allow dogs off-leash freedom and let them be a dog. I have lots of experience working with dogs and have never “lost” a dog…well, I did as a teenager, but never professionally. I’ve examined and tested recall and, though there is no guarantee or 100% fail-safe way, I pride myself on being able to simultaneously work with multiple dogs out in the real world. I’ve taken a break from running around in the woods to raise my own non-fur baby. This time has brought me to a whole new level of positive training. Concepts like contrafreeloading, reducing or eliminating strategies like withholding, and the like, have been blowing my mind and my training has evolved a lot. I possess a unique set of abilities and experience. I have a great eye for movement and can read an animal well. I want to DO stuff rather than stop your dog from doing the wrong stuff. It turns out that this sort of proactive approach has a lot of benefits and often takes care of problems without agonizing over them. Which means you might just find yourself having a lot more fun, practicing tricks and games (some for fitness), and reaching a higher quality of life with your dog. I’m into quality and am committed to what I believe to be the most ethical path to working with our best friends. Thanks for taking the time to read this novel. I wrote it because it’s important we are a good fit because time and energy is precious.